Fun fact: Kuuchamaa Mountain was the first Native American sacred mountain to be recognized on the National Register of Historic Places solely on the basis of its significance to indigenous peoples in 1992. 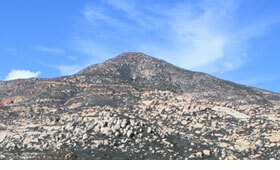 Kuuchamaa mountain is considered to be the most sacred mountain of the Kumeyaay people. Its namesake was a powerful Kuseyaay (religious leader) whose coming was foretold in the creation story. During his life, Kuuchamaa used the spiritual power obtained from the mountain to call for peace and healing among the Kumeyaay and neighboring nations. The positive message of personal discipline, peace and harmony found reception across religious doctrines and is carried on today among the Kumeyaay. The mountain was also known as a special healing site that people would seek from long distances. 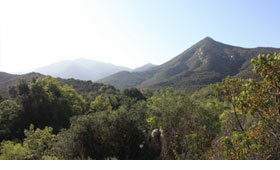 Kuseyaay from throughout the Kumeyaay nation and neighboring nations would make pilgrimages to the mountain to gain the power and ability to do good for all people. In planning the use of the Kuuchamaa property, the KDLC is working to incorporate the spiritual message of Kuuchamaa with the sanctity of the location to promote spiritual growth, healing and recovery from the physical and mental traumas of modern society. 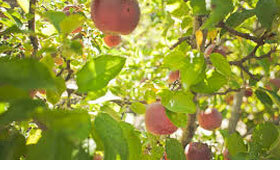 In this way, Kuuchamaa continues its eternal purpose of providing the power and ability to do good for all people.